Texas Defense Force Security – Professional Security. Redefined. Texas Defense Force Security is a licensed Guard Company in the State of Texas. Our license allows for us to do Security Guard functions, Body Guard assignments, and Private Investigations anywhere in the Lone Star State. That's the "Who" and the "What," but what about the "Why?" To use our skills to promote that kind of tangible safety and stability is what we are about. Think of us as Texans protecting Texans. 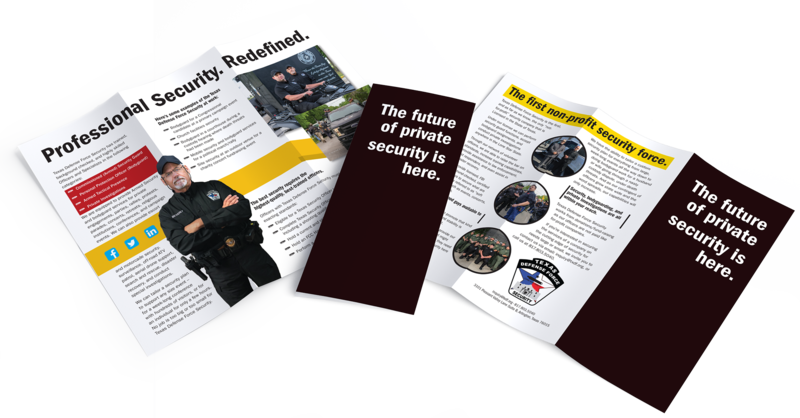 As the first, and as far as we know, the ONLY "not-for-profit" security firm licensed in Texas, we're in a unique position, as we're not focused on, well...profit. Instead, we focus on getting the job done. Through our network of volunteer officers we are able to raise the bar on our standards, increase our training capabilities, improve the standing that we have in our communities and provide assistance to Law Enforcement, First Responders, and even in cases of Disaster Recovery. The first non-profit security agency in Texas is long on skills and even longer on services. Here's what we mean. Need security at your next event, convention, meeting, or function? We have that covered. When lives are in danger, our team is on the job, 24/7. We stand ready to protect you or your loved ones. We are mobile and fully-equipped for any contingency, including response to natural disasters. Discreet. Confidential. Thorough. Our investigators deliver results, no matter how sensitive the challenge. When loved ones are missing, or disaster strikes, we stand ready to help. Whatever it takes - we're there. We offer the same cutting-edge training for customers that our staff undergoes to qualify for our team. Sometimes, a picture is worth a thousand words. And sometimes, it means a lot to hold something in your hand. For those of you that prefer your words on paper, click on the photo to download our print brochures in PDF format. Or give us a call, and we’ll send you one, already printed. Officers of Texas Defense Force Security are patriots who desire the training and education to protect and defend our fellow Texans and our inalienable rights while following the law, without having to become a Law Enforcement Officer. Texas Defense Force Security is licensed by the Texas Department of Public Safety Private Security Bureau as a Guard Company and Investigations Company. If you're interested in becoming one of us, click here.